Over at Lucy Designs, we found these beautiful wooden dragonfly wall art made out of recycled table legs, fan blades, and other parts. Given the variety of table leg styles and blade shapes, not to mention wood stains and paint options, there are numerous dragonfly designs to be made. 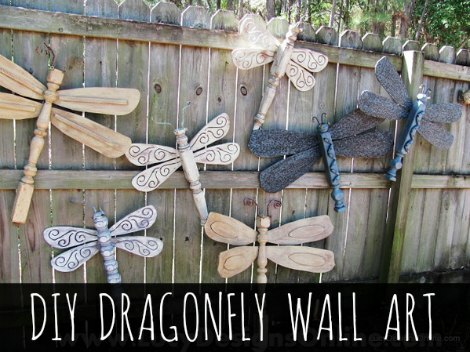 While Lucy intended her dragonfly art to be displayed outside and on a fence, these could easily be showcased indoors in any room in the house. We love the creative use of the recycled parts and the whimsy of Lucy’s designs. They are simply stunning. We often see piles of old fan blades and table legs available for practically nothing at the local Habitat For Humanity ResStore. These could also be picked up for cheap at thrift stores and garage sales.